In winter 2007 American artist Catherine Forster had an exhibition in Chicago entitled Roja’s People. Elīna Cērpa’s production of Gentleness after the Jorge Luis Borges story La Intrusa, begun in Roja and performed at the New Riga Theatre was nominated as the most innovative production of the season. In Lucerne Swiss artist Ruedi Schorno exhibited panoramic photos taken in Roja. In France Hélène Gerster read her essay on Roja to capacity audiences in theatres in Lyon and Marseilles. And that is only the beginning. They all participated in the ROJARAKU art laboratory. The feelings recorded during their time there continue to be exhibited. In 1997, while still at the Latvian Academy of Art and feeling the shortcomings of the academic system and the need to look for and find new forms of art and possibilities for self-expression, students Kristīne Lazdāne and Māris Grosbahs, together with lecturers Dainis Lesiņš and Ainārs Rimicāns, organised a ceramics symposium in Roja, which they called ROJARAKU. Roja is a small fishing town by the seashore and raku is a visually impressive yet relatively technically simple technique of firing ceramics. The event was made possible thanks to the initiative of the organisers and the support of the national and local government as well as businessmen and the inhabitants. Although Latvia had regained its independence, the possibilities for receiving information on what was happening in the world and possibilities for communication were still quite limited. That is why ROJARAKU in the summer vacation offered students and actively creative artists from various countries an environment for the exchange of experimental ideas. In the beginning it was all centred on the treatment of clay and stone, firing in the flames of an open fire. These were later supplemented by installations, environment art, photography, video, social activities, shows, performances and other forms of media expression. In 2002 the interdisciplinary art group Serde was founded, its members initiating and realising art projects. ROJARAKU is one of the autonomous events organised by Serde. The experiments of previous years in the ceramic kilns of living fire are continued in the annual fire shows on the last night of the project. Uģis Pucens hung large sized bags of fire over the sea. In contrast with the usual and by now commonplace firework displays, this show allows the author’s creativity to be expressed successfully in the existing environment without the noise of loud explosions. Taken together, the flaming bags of fire spinning in the wind and scattering sparks, their reflections in the water and the author’s constant adjustments achieve an impressive result full of vibrating feelings. A year later Ieva Rupenheite wrote in the daily newspaper Diena: “…Raivo Armuliks had selected his contribution to the Roja environment from the world of readymade images demonstrating independence from the tempting formula of Sea+Sun+Wind. His work Brainwashing consisted of an unnatural-sized yet lifelike brain being rinsed by the waves. Funny, yes but what of it? Although it was outside the locally determined conditions and completely apolitical, Brainwashing nevertheless fitted in wonderfully with a game on a larger field; it not only fulfilled the functions of a sarcastic joke but also encouraged the observer to become suspicious of, if not already suspecting the specific target of this brainwashing.” (“Skaistāks par kuģi” [More beautiful than a ship], Diena, 30.08.2004, p.14) Armuliks’ work was not destined to be washed for long by the breakwater. A local art aficionado had used a crowbar to brutally lift the “interesting stone” from the sea and Roja had its first “brain thief”. In Soviet times Roja, which was in the “off limits prohibited zone”, was dominated by the fishing industry. Today, as the Baltic Sea fishing stocks have become depleted, the small town is turning more and more to the development of tourism. This is one of the reasons why in 2004, Lithuanian artist Hilbertas Jetkevičius realised his Yohaidi project as a reference to the existing situation by creating “monuments of memory”, thus pre-empting the development of all-conquering tourism. The slang word “Yohaidi”, common in all three Baltic states and used as an expression of wonder or surprise, becomes, like a comic strip hero, the carrier of the clichéd name of “Japanese tourist” formed in stone. During the action Yohaidi was placed in various Roja locations – in the town centre, by the cash machine, in the port, cemetery, in a barn and by the proud sign “Roja” at the foot of the monument to fishermen by the culture centre, which had previously borne the slogan “To communism!” Yohaidi set off for reality creating its own unmediated story about the existing situation in Roja, not fearing either to look into its yet to be tidied up backyard and recording it with the stoneware camera placed on its stoneware chest. Diagnosing the problems of the local surroundings, the following year Latvian stage designer and media artist Izolde Cēsniece demonstrated a deft dialogue with the town space and its inhabitants. She placed her installation Nike of Roja, which was reminiscent of a visually brilliant scarecrow, on the roof of a now ruined former department store from Soviet times. In the public space passions were stirred up about the building’s future. For many years, this once proud store stood in the very centre of town like a dilapidated windowless oddity while its owners changed waiting for the price to rise. Cēsniece’s Nike, like the Goddess of Victory and sister of Cratos, Bia and Zelus in ancient Greek mythology, achieved what the local council could not having fought unsuccessfully with the building’s owners to get it refurbished. In the website www.performance.lv, the artist says: “If I put everything in the right places then there is no longer any need to add anything because it all happens like I want it to of its own accord.” Perhaps it might be too rash to say it was the last straw that made the building change, but that’s what happened. 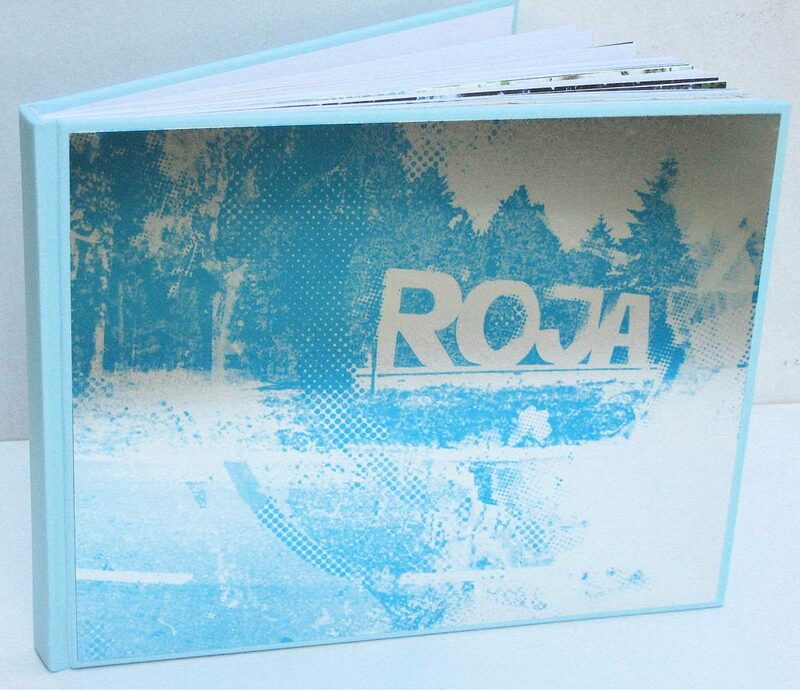 In the first week, alongside the objects, performances and works in other media, the ROJARAKU group of artists in co-operation with the local printshop RAUDA, produced a booklet reflecting their experience in Roja. RAUDA specialises in printing labels for fish product packaging and so, by slightly changing the original RAUDA design for tins of sprats, new packaging was created for the booklet. The tin covers of this book were also produced with the help of RAUDA. Catherine Forster (USA), having found the Roja people to be reserved and cautious decided not to be obtrusive and created the video work On Foot, which records her attempts to communicate with the local residents but pointing the camera downwards. Forster depicts one day from dawn to dusk filming her feet and including those of passers-by and her partners in conversation within a one-metre radius. By 2006 when the laboratory celebrated its ten-year anniversary, there was already considerable competition for the ten residencies. This is testimony to the growing quality of the laboratory activities. And today too, in the spring of 2007, when we know that there won’t be a ROJARAKU in summer and in future it may only be organised every two years, there is great interest from potential participants from abroad. The Roja pine grove not far from the multi-storey housing block district was, for a couple of months, home to German artist Ursula Aschernkamp’s work Wooden curtains or, the vertical expression of a horizontal dream. As the value of private property increases, the public space decreases and private interests often prevail over the public interest. Aschernkamp’s work may be seen as a warning sign, an invitation to stop and value what exists, or as a positive ironic comment on the many new fences. One of the perhaps less noticeable works yet one which remained long in the memory was the verbal messages on metallic plates by Brian Gillis (USA). Although they were independent and dispersed throughout Roja, they faultlessly corresponded to the aim of the laboratory – to encourage the interaction between the town’s residents and visitors with the surroundings and the works “hidden” there. Gillis says: “I’m interested in intervening in the environment with a story, in canonising everyday things and events that later change people’s perceptions. My works here are like catalysts to create a deeper understanding in people about places they use on a regular basis.” For example, one of the texts that was screwed to a bench in the bus station had the message: “I have forgotten how wonderful trees smell in the rain,” he said to himself getting off the bus. “I can’t wait to meet Maria’s children.” Gillis’s sentences, ripped from some broader context, place you in a current, they sharpen the senses and allow you to experience and extend the boundaries of what is possible.